Are Formula 1 drivers overpaid? NO!, says Felipe Massa, who earns an annual salary believed to be in the region of around $8 million, while his Scuderia Ferrari team mate Kimi Raikkonen reputedly earns at least three times that sum (and patently is not three times better). Ferrari team boss Stefano Domenicali recently floated the idea of teams reducing driver earnings in a bid to cut expenditure in F1 which has been acutely affected by the global economic downturn, and had already lost Honda at the end of 2008. Mind you, I don’t know of anyone who would really agree to a pay cut, though sometimes it has to be done. Take the ridiculous salary of the chief executive officer of GM in America who has overseen the greatest cumulative losses in the history of the company, and up till 2008 was being given multimillion dollar bonuses. On top of a base salary of $2.2 million, he was eligible for up to $3.5 million in incentive payments and a grant of 165,563 shares of GM stock if he meets the internal targets. He will also receive 500,000 stock options that will vest over three years and 75,000 restricted stock options that will vest in three to five years. In real terms, as the company’s annual proxy statement notes, Wagoner’s salary comprises only 17 percent of his total compensation. The remaining 83 percent of his $10.1 million annual pay package comes in the form of stock awards, option awards, pension sweeteners, and $769,566 in “other” compensation (life insurance, financial planning, personal travel on the corporate jet, bodyguards, and dividends on restricted stock). I have personally never been a unionist, but you can sympathize with the shop floor workers who are being retrenched, while the ‘captain of the ship’ gets such astronomical rewards and is still in command on the bridge. So perhaps poor Felipe’s meager $8 million pittance as a driver, is about right? Sorry, Felipe, you too are grossly overpaid, as are many other so-called sportsmen. Let’s look at David Beckham who reportedly earned $22 million before he went to the US, making him the highest-earning footballer in the world. On top of his $5 million salary from Spanish team Real Madrid, he also raked in $17 million in advertising and sponsorship deals. And that’s for kicking a ball into a net! Another ball-kicker is Wayne Rooney of some team in England, who has received an annual salary plus bonus of $7.1 million and then endorsements of another $13.3 million. You can add to this list of overpaids, such people as tennis ace Roger Federer who makes $25-35 million for hitting a ball over a net and screamstress Madonna who got $50 million for wearing fish nets. No, folks, none of them are worth it. Last week I asked what did you know about windscreens? Which car came out with the first curved windscreen without a central divider? The clue was: think American and think in trouble. The correct answer was the Imperial model Chrysler Airflow of 1934. So to this week. Take a look at the photo, which came from the London Illustrated News of 1953. 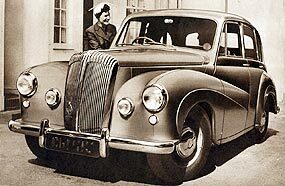 A Daimler Conquest which was advertised as having performance for the “fast driver”, being able to do 0-60 mph in the blistering time of 20.4 seconds (probably timed using a calendar I would suggest), and a top speed of “over 80”. The advert suggested that this was the car to provide “a combination of pace, performance and pedigree.” After that long-winded introduction to the quiz question this week - why was it called the “Conquest”, and be warned, the purchase price was five shillings and ten pence over 1,511 pounds. Seventeen races on the calendar for 2009, with no races scheduled for North America. Spa is still on the calendar, thank goodness, one of the few driver’s circuits left on the program. Bring sleeping bags to watch Shanghai, Monaco, Hungary, Valencia and Singapore. Along with changes to bodywork, vehicle weight and tyre size, Kinetic Energy Recovery Systems (KERS) are allowed. Regenerative brake devices designed to recover some of the kinetic energy that is normally dissipated as heat during braking. The recovered energy could be stored electrically, in a battery or supercapacitor, or mechanically, in a flywheel, for use as a source of additional accelerative power at the driver’s discretion. All mechanics must use rubber glove due to KERS adoption. Slick tyres will be back again provided by Bridgestone. This was in return for Mallya saying that Karthikeyan - who became the first Indian to drive in Formula One when he turned out for Jordan in 2005 - and rising star Karun Chandhok, were not good enough to drive for Force India, something Karthikeyan claims he wouldn’t even want to do. “I never even approached Mallya. The vibes from the camp have been extremely negative and I want to make it clear that I am not interested in driving for Force India,” he added, just in case Vijay did decide to throw him a bone. Currently, Karthikeyan is driving in the A1GP series for Team India. That’s a lot of curry being thrown about, but I doubt if Mr. Mallya is losing much sleep over Karthikeyan’s posturing. 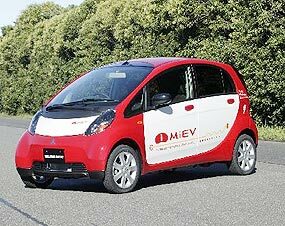 Mitsubishi are getting very close to releasing their small electric cars having made 100 prototypes, and will supply two test cars to NZ authorities to evaluate this year (2009). The global roll-out should be in 2010. 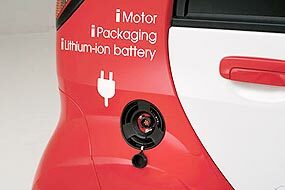 The i-MiEV uses a single-phase overnight charging device, a simple winding charger that plugs into a 15 amp wall socket. Home sockets are 10 amp with an earth pin the same size as the other two. On a 15 amp plug the earth is longer; most switches aren’t rated to handle 15 amps, but their wiring is 20 amp, so the only changes i-MiEV owners must make is to their socket. A full charge overnight will take the car 160 km, while a quick-charge system produces 80 percent charge in just 30 minutes. Those buying an i-MiEV will effectively get a standard i-car (unfortunately not available in Thailand yet), with the same specification - including air-conditioning and airbags - as the petrol version. The differences are hidden. The high-density lithium-ion batteries - with 22 modules of four cells each - fit beneath the floor along with the motor inverter, the charger and control unit. They replace the fuel tank with the electric motor displacing the rear-mounted petrol engine. Thus there are no modifications to the bodyshell at all and no changes to passenger or luggage space, though the suspension is certainly different, to cope with the additional 180kg of weight. Those who have driven one of these prototypes say there is incredible low-down punch from even this modest 47 kW electric motor, which like all the electric vehicles pulls at its best from rest. So where the standard 48 kW/95 Nm car feels relatively relaxed, the electric version throws 180 Nm at the road, that torque only dropping to equal the petrol’s at higher revs. Claimed zero to 80 km/h acceleration is 1.5 seconds faster for the electric i-car, and it’s positively perky at round town speeds, particularly during pulling from junction manoeuvres. Cruising the straights, the i-MiEV initially feels just like an i-car on speed. There’s a lot of extra weight beneath the feet, keeping the center of gravity low. Just like the standard i-car, this is a city-slicker - not an open-road warrior. All that extra weight clearly makes itself felt, though the effect is predictable and gradual - front-to-rear weight balance isn’t available, but the extra heft appears to be evenly spread, the batteries stretching as far forward as beneath the driver seat. In common with most reports on evaluating electric vehicles, one factor that could be problematic is the car’s silence, for unlike a hybrid there is never a petrol engine at work, so there is nothing to warn pedestrians that the electric vehicle is approaching. Mitsubishi claims that ‘well to wheel’, electric vehicles are five percent more efficient than petrol hybrids and 15 percent more efficient than diesel; and boast a quarter the CO2 emissions of a petrol engine. Mitsubishi is just one of the manufacturers on the way to saving the planet. Let us hope that just because the pimps at the pumps (the oil cartel) have let the price of crude come down again that the push towards EVs is not slowed any further. I will be happy to pay more for my electricity account and pay nothing to Big Oil.